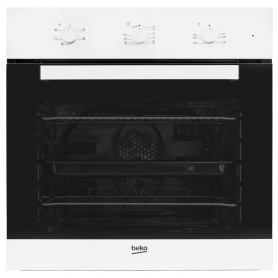 The Beko CIF71W is a 60cm single fan oven, with a large gross capacity of 66 litres, perfect for a Sunday roast with all the trimmings or any other family gathering. 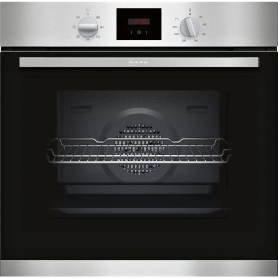 It’s exclusive to Euronics and Agents stores, so you won’t find this fantastic oven anywhere else. Four different programmes ensure that everything you cook has the perfect conditions. If you love baking, you’ll love the fan function, which helps circulate hot air, ensuring an even cooking temperature. The grill with fan function helps give your meat a delicious rotisserie style cook. The fan circulates the heat evenly, whilst the grill switches on and off during cooking to give meat a crispy skin. A full width variable grill allows you to adjust the temperature to suit your meal. Perfect for when you need a high heat setting for a quick piece of cheese on toast, or a medium/low heat for a healthy grilled chicken breast. The defrost programme allows you to quickly and safely defrost meat, poultry, bread, and more. With simple to navigate and easy grip control knobs, the Beko CIF71W couldn’t be less difficult to grasp. You’ll be mastering new dishes right from the start, and the helpful mechanical minute reminder will alert you if you’ve forgotten anything. With a 100 minute auto cut off for dishes that require longer cooking times, you’ll never burn anything again. 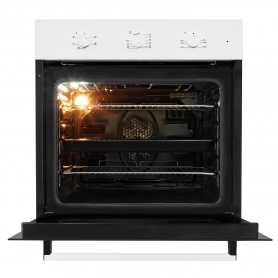 A full size enamel cooking tray with internal grill rack, as well as 2 shelves are included, letting you vary your cooking styles. The large, double glazed oven door has a full glass inner door, ensuring that there are no gaps for dirt to enter and build up. Coupled with the interior light, this gives great visibility to check up on whatever’s cooking. 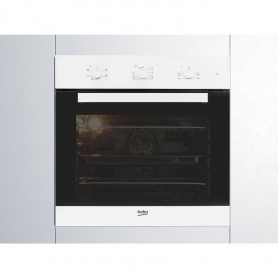 Beko's SimplySteam function makes this oven easy to clean, and it's also got an enamel interior – just wipe away food and grease and you’re good to go. The glass inner doors are also removable if they need a more thorough wash.
Get peace of mind with a two year promotional guarantee (one year standard plus an additional one year). Simply register the product within 90 days of purchase either by phone 0800 597 8646 or online at beko.co.uk/register. 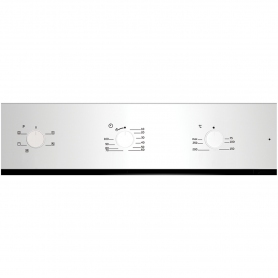 The CIF71W is not only practical, but its sleek white design will also fit perfectly into any modern home. Order one today.